After this many years of having a period, you would think that I would recognize "low self-esteem day" when it comes, but no......It generally occurs 2-3 days before bleeding commences and may be accompanied with a headache (migraine for me in peri-menopause) and anxiety (worrying about the future). My first memory of this experience came a year or two after I started menstruating. I was convinced that the world was about to end due to the impending nuclear holocaust (well it was the 1980's!) Sobbing on my mom's lap, she gently asked "are you about to get your period?" to which I replied "yes, why?" Here is the general sequence of events: I'm feeling fine, even great one day and then the next I feel like I'm fat, undesirable and life is not worth living; two days later I get my period and the malaise has lifted. I started talking to other women using the term "low self-esteem day" and they all could relate. The other piece of it which is trying is that absolutely no rational argument at this time can help this state, because I'm not rational! What I've come to appreciate over time, though, is that while I am not rational, I am exceedingly more intuitive and creative at this time. When I can allow myself to go with this emotionally open and vulnerable state I often get answers to internal questions and am able to look at and heal deep wounds. The word "irrational" implies that there is something wrong with not using your analytical intellect alone. We are uncomfortable in our culture when people are emotional and sensitive and even more uncomfortable if a woman is "out of hand" in expressing her strong emotions. So instead, we emotionally sensitive, creative souls stifle our authentic selves until some event in our life allows us to break free again. I say again, because, I have a memory of expressing myself more freely as a child which feels like it was tamped down right about the same time I started menstruating. 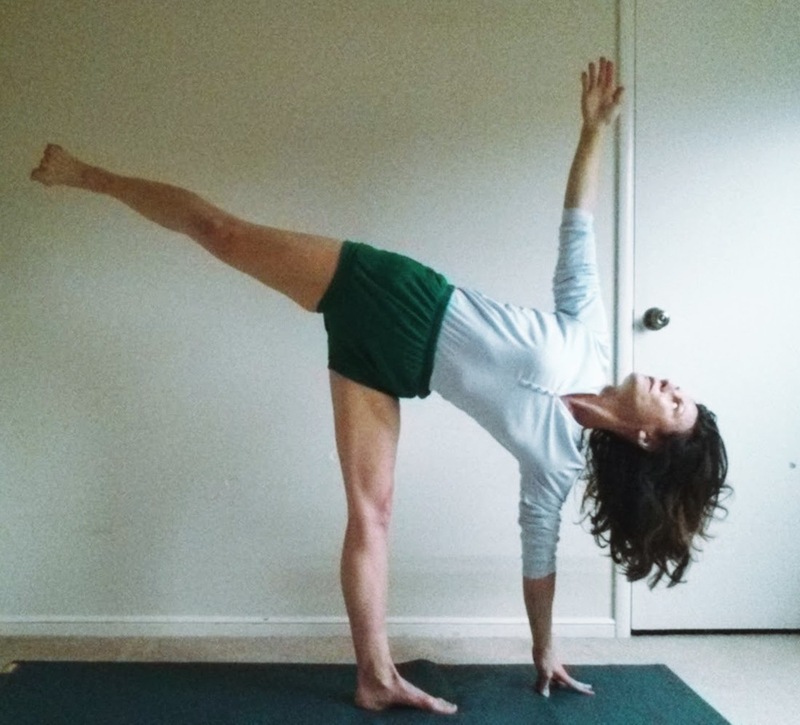 Adho Mukha Vrksasana*: repeat pose changing hand positions and kicking up from opposite leg x3 or 4 times; hands out, wrist to wrist; hands forward, classic position; wrists facing wall; head looking up at chest; head looking back at wall; keep sternum lifted at all times. 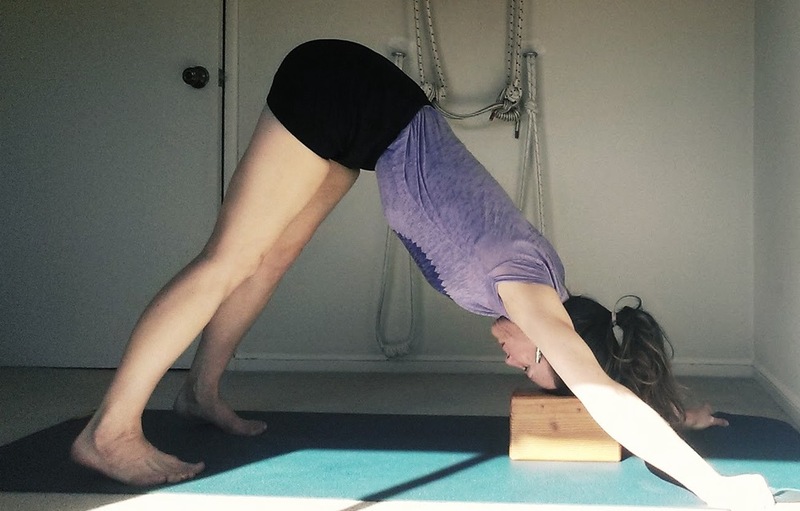 Pincha Mayurasana*: repeat pose changing hand positions and kicking up from opposite leg x3-4 - palms squeezing brick; thumb and index finger webbing at brick class hand position; palms facing the ceiling with inner wrists at brick; head looking up at chest; head looking back at wall; keep sternum lifted at all times. *Better to be instructed in these poses by a qualified teacher before attempting on your own. These poses may not be good for headache conditions although they will help relieve tension in the upper back and neck. A woman's body has a natural system of cycles which repeat more often than any other mammal. Every 28 days or so during our “child-bearing years” we experience a building up of energy which gives us a sense of vitality and well-being and may or may not lead to a new life; coupled with a shedding of tissue and blood which can bring us into an internalized, intuitive, restful state. In our culture, we revere the active state where we are “efficient” and “get a lot done”. It is borderline strange if someone desires to rest without being sick or tired. We are not rewarded for being reflective, for listening to our inner voices, for trusting that we will be ok if we aren't “doing” something. The practice of yoga focused on asana (physical postures) and pranayama (breath awareness) puts us back in touch with our body-mind connection and makes us aware of these natural cycles again. These natural cycles are also reflected in our outer world in the cycles of day and night, the cycles of the moon from full to empty, the change of seasons from summer to winter. When we support our natural cycles and even appreciate them, we experience less tension and more contentment. Today the moon is slightly more than half full waxing towards a full moon on March 12th. The full moon's brightness and fullness reflects the state of fertility, vitality and creativity. During this time in our yoga practice (in the middle of our menstrual cycle) we have more physical energy and stamina and may want to do a more active practice. Back extensions are an excellent way to utilize this energy and at the same time invigorate our kidneys and adrenal glands. 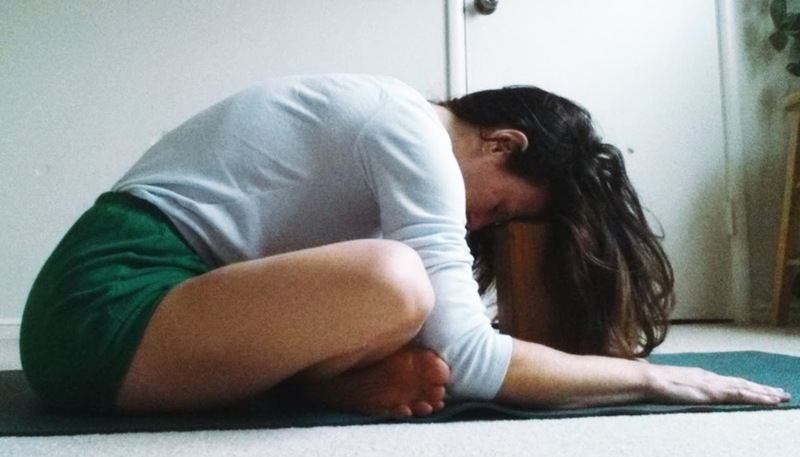 Dwi Pada Viparita Dandasana (two-limbed inverted staff pose) or so eloquently called “the yogini's prayer” by B.K.S. 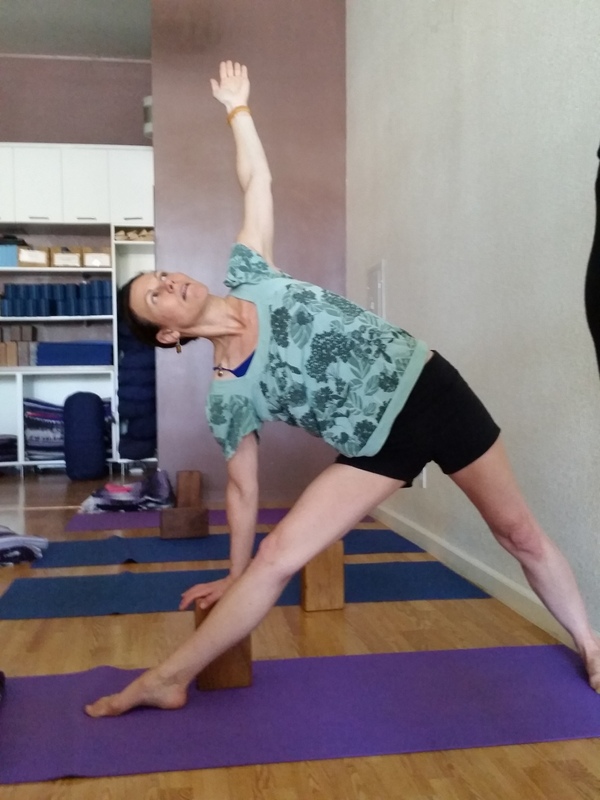 Iyengar is a powerful back extension that brings life and light to the body and mind. Below is a modified version of the “Women's Energizing Sequence” from Patricia Walden in “The Women's Book of Yoga & Health” written by Linda Sparrowe. 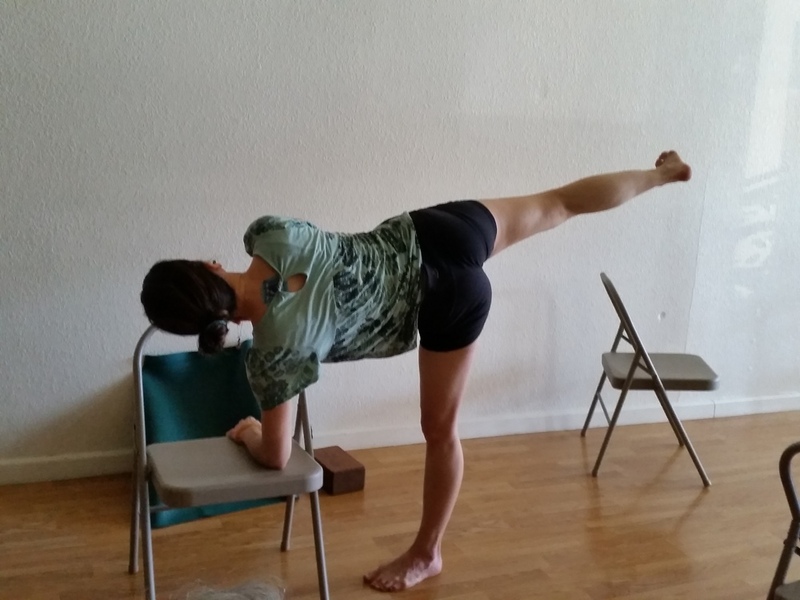 This is an Intermediate level practice which assumes some knowledge of the foundational poses of Iyengar yoga. I have specified the poses that may not be appropriate for beginners. That said, don't be afraid to practice on your own and make mistakes! This is an important part of our practice. The willingness to explore, play and create! Stay tuned for the next installment of Exploring Cycles of Activity & Rest! Finish off your practice for healthy elimination of the digestive tract with these two "super poses" for overall health of the organic body. 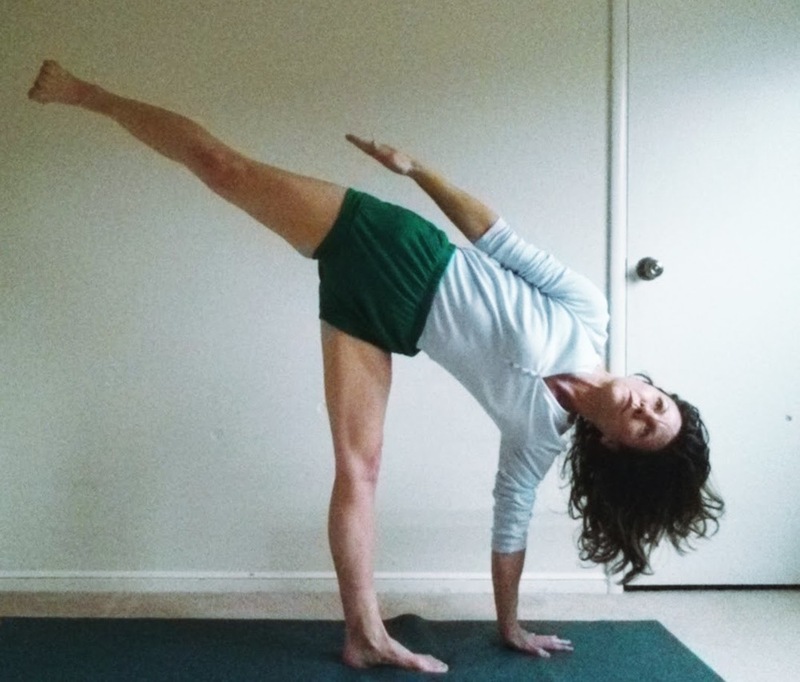 Setu Bandha Sarvangasana (Bridge Pose) is included in most of the therapeutic programs in the back of Light on Yoga. It was named "God's gift to humanity" by B.K.S. Iyengar himself. This version is on a brick which puts more of a stretch on the abdomen. I have shown the entry onto the brick which is on the tall height and thinner direction. The brick should be places on the lower sacrum near the tailbone. To come out, grip the buttocks and lift up. Keep the buttocks gripped until you reach the floor, then let go. Next, Viparita Karani (inverted action/lake pose) is an inversion where the abdomen goes into a natural bandha (seal) when done correctly. I have shown one version on two blocks. One block can also be used. Note that the block is now turned width-wise. I have also showed a version with a bolster and the wall. We are still talking about constipation here! 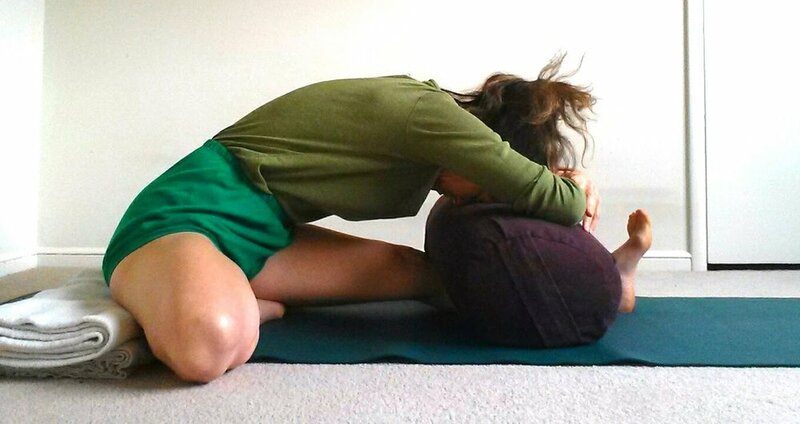 Seated forward bends are an excellent way to work on clearing the lower abdomen (this is why they are also the hallmark of the menstruation practice). However, seated forward bends can be difficult for us when we are tight in the hips, buttocks and hamstrings. Then attempt the king (or queen?) 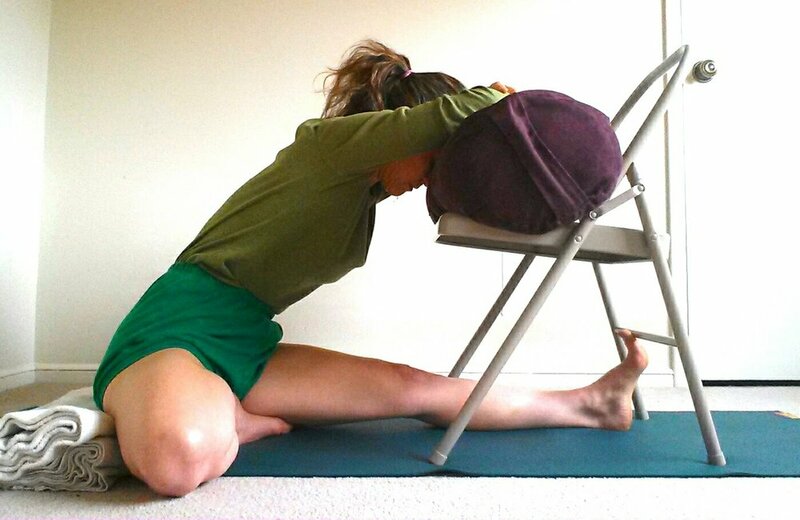 of seated forward bends, Paschimottanasana (intense stretch of the west/backside of the body). I have places a length-wise bolster all the way up into the abdominal cavity. Rolled blankets can also be used. Please use enough height so that you keep the sacrum in a healthy, neutral position to protect your lower back. Finish up by doing a couple of seated twists, Bharadvajasana I. Repetition in the twists is better than holding so do 3-4 rounds. We're still on constipation here! 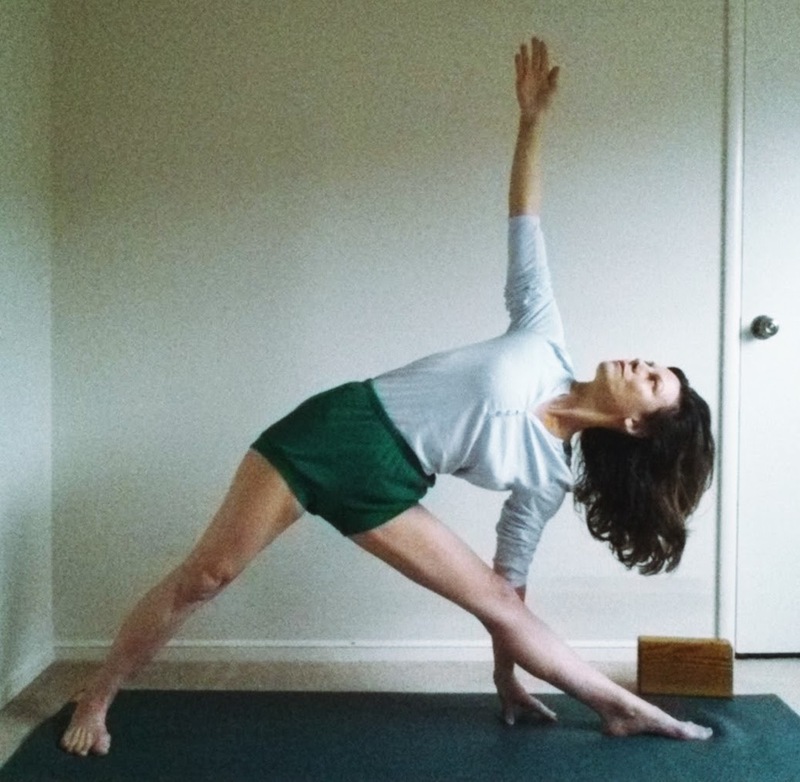 After the standing forward bending poses, do these standing poses which stretch and open the abdomen as well as "get things moving." Ustrasana (Camel's Pose) is a back extension pose which invigorates the heart. Check out Heather Haxo Phillips demonstration right after getting off the plane from visiting the Iyengar Institute in Pune, India! And, naturally there is a supported version!